I’ve been working on an IT Project Management Masters for a while now, in fact I only have six weeks left until graduation. Given that I’m doing technical work at the moment I do not plan to pursue Certified Associate of Project Management (CAPM) or Project Management Professional (PMP) from the Project Management Institute (PMI). They’re fine certifications for those that are doing or hope to do hands on project work, but right now I’m really enjoying still working on the gear and do not plan to pursue CAPM or PMP for another five years. However, all of this Project Management knowledge is still fresh in my brain so I turned to CompTIA and their Project+ Certification. The test is from 2009 which means it’s one version behind of the Project Management Body of Knowledge so if you plan to work directly off the material be mindful of the differences between the 4th and 5th editions of the PMBOK. The CompTIA suggested price for this is exam is $279 and the exam does not expire. Early in January 2015 I received an e-mail from CompTIA offering to participate in a new pilot program they’re running. 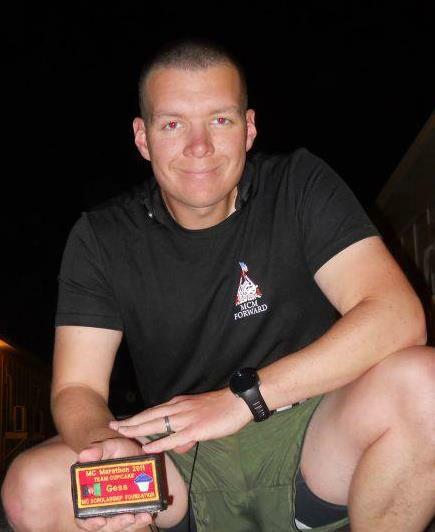 The program offered $100 certification exams and the opportunity to sit for the exam at home. They have partnered with ProctorU, an online proctoring service that utilizes your webcam and a locked down browser to monitor you while you take the test from the comfort of your own home. It’s used by a lengthy list of colleges and other institutions and this is their first partnership with CompTIA. Initially I was interested in the program but wagered it would still be around when my classes were done in April. Fast forward to this week when I happened to be browsing TechExams.net and noticed the program had ended and ProctorU had slashed the exam price down to $50 per exam but with a solid expiration date of 3/31/2015. This offer is valid in the United States and Canada only. It’s easy to take advantage of the offer. Just sign up for an account and login to ProctorU and add CompTIA as your institution. After you’ve entered your information and created an account and then selected Schedule New Exam. 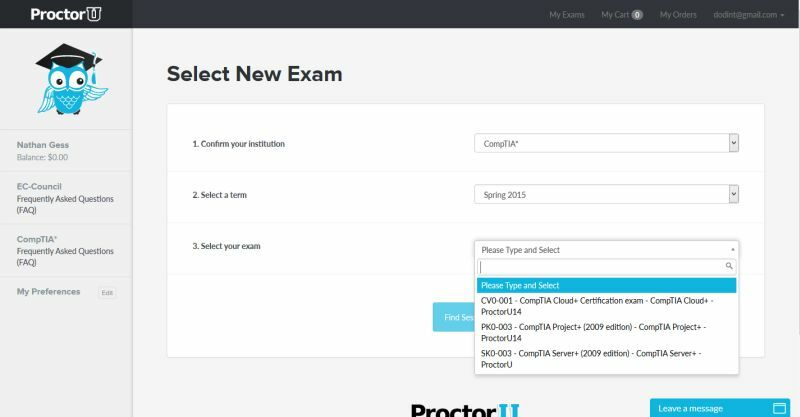 The screen you see below will list your choices and you can add each exam you’re interested in to your cart individually. Once you pay for your exams (no shipping or tax, an even $100 USD for my two exams) ProctorU will send you a voucher code via e-mail. Each set of codes will come in a separate e-mail. Login to your account at Pearson Vue (or create one if this is your first exam) and sign up for testing. As you work through the Pearson Vue site the cart will reflect the full $279 until you enter your Access Code and Promo Code. Given that I already have some virtualization experience I’m going to try my hand at Cloud+ first, and Project+ a week later. If I enjoy the experience I may try to squeeze Server+ in before the end of the month. The short deadline is somewhat difficult but has motivated me to knock these two certifications out and clear them off of my certification track. 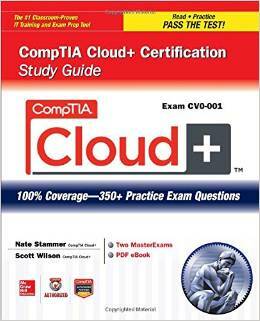 Incidentally, if you go to Amazon you can get a 7-day trial of Stammer and Wilson’s CompTIA Cloud+ Certification Study Guide to use to freshen up on your virtualization knowledge. It is worth nothing that the Cloud+ exam does require renewal in three years or it will expire, but it can be renewed by completing higher level CompTIA certifications so this is not a concern for me. It’s important for me to point out that I do not work for ProctorU, CompTIA, or PearsonVue. Though I do have an Amazon Referral account. I just wanted to pass along the opportunity to get about $850 worth of certifications for $150 out the door. This is very likely going to be the cheapest way to obtain these exam certification vouchers ever. Best of luck and happy testing. Recently I had the pleasure of working with one of the best amateur chefs I have ever met, Katie Riesbeck. The last week I worked with her she brought in a great batch of Shrimp Chowder and was kind enough to pass along the recipe. I used it for a party at my home and everyone seemed to enjoy the chowder so I’m paying my good fortune forward. The recipe itself is very easy to execute and is made with ingredients that you can find at a common grocery like Wal-Mart. After dicing green onions, garlic cloves, and potatoes add to a large pot with butter and melt over medium heat. Soften mixture, but do not let the potatoes brown. Add in the potato soup and skim milk. Take your cubes of Neufchâtel Cheese and add them to the chowder; Neufchâtel is very similar to cream cheese but is lower in fat and slightly firmer. You may use cream cheese if Neufchâtel is unavailable, they should be faced together at your grocer. Resist the temptation to turn up the heat to melt the cheese, rather allow the cheese to melt slowly and stir often. Do not allow the chowder to come to a boil at any time, it will ruin the taste. Stir often. Once the cheese has melted add shrimp, corn, pepper, and creole seasoning then turn the heat to medium-low just above simmer. Not being a big corn-in-chowder fan I used a single small bag for a double batch. Put a lid on your pot and let it cook for 30 minutes while stirring often. Doubling this recipe will fill a normal sized crockpot nicely. 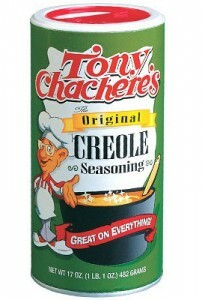 I prefer to serve with slices of french bread because as the chowder thickens it begs for dipping. 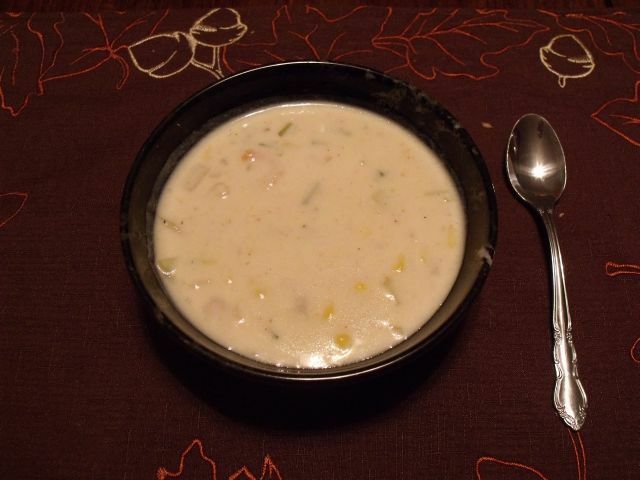 I can’t speak directly to the nutritional value of the meal; however, we do pay attention to our sodium intake at our household and I have to believe that this is a relatively healthy option in that aspect as it is a rare chowder that is tasty enough not to require a sprinkling of salt. Special thanks to my good friend, Kim. She made the recipe herself and did the math on sodium. It turns out that each cup has 636mg of sodium which is above the recommended level; this effectively changes the recipe from a smart tasty choice to a guilty pleasure.